Just back from the recording of the series 3 episode "Rotterdam". I'll keep my thoughts and comments general rather than adding spoilers about the contents of the episode itself. Cabin Pressure has definitely been taken over by the Cumberbatch effect, as the vast majority of the audience was women, and with the exception of some old crusties like me, most of them were fairly young. The occasional sighting of a lesser-spotted male audience member was always a bit of a shock! I joined the queue shortly after ten a.m. and was about tenth in the queue, and we were finally admitted into the building at around 11.45. Unfortunately we were then let into a bar area where any semblance of queuing went out of the window, so getting there that early didn't guarantee you the best seats. We then had to stand around in the bar for over half an hour, and the noise of so many young over-excited voices was almost intolerable for someone with sensitive hearing like me – plus my back and my feet were killing me by then! Finally we were let into the recording room, which almost got dangerous with the amount of shoving that was going on until someone yelled at everybody to slow down. Jules, who had made it possible for me to be there by kindly giving me one of her tickets and who had been to the Christmas recording and knew the layout of the room, galloped to grab seats in the middle on the second row, which gave a particularly good view. I thought that being in the first row of the Circle at the National gives you a good close-up view but being so close to the cast here was quite exciting for someone like me who doesn’t get out much! It was really interesting to watch how they record the entire episode straight through, only pausing if someone fluffs their line or there’s a technical problem, and then the producer comes down afterwards with a list of notes and asks them to re-record certain lines or sections. I can’t help but wonder how they’re going to segue everything together, because Benedict was distinctly hoarse and his tone dropped more and more as the recording continued. They cleverly explained it within the episode by having Martin talking to Karl at Fitton ATC near the beginning and mentioning that he’s got a bit of a sore throat, but I do wonder whether his voice will be lower in the re-edited lines than in the rest of those sections. It was clear that he was trying really hard to stay at the same pitch but there were times when he just couldn’t get his voice to stay up. Both Roger and Benedict have moments in the episode – if they make it to the final broadcast, of course – where they do a fairly long solo speech, each of which prompted a spontaneous round of applause at the end. It was also delightful to watch the way that John Finnemore – who really does appear to be Arthur in real life! – would grin with relieved delight whenever a line got a huge laugh. Almost the biggest laugh of the day came when Benedict – re-recording the opening introduction – took a deep breath and rattled off, “Cabin Pressure by John Finnemore, starring Stephanie Cole as Carolyn, Roger Allam as Benedict ... um ...” followed by the trademark Cumberbatch embarrassed grin. Only Ben could get a massive cheer and a round of applause for getting his line wrong! Paul Shearer was one of the two guest actors, voicing both Karl at Fitton ATC and a new character who will be appearing in a few episodes. However, there was much confusion when Benedict, voicing the closing credits, named the character as being played by Anthony Head. It turns out that Anthony will be playing the character but wasn’t available today, so Paul kindly voiced his lines to give the others someone to bounce off, and Anthony will record into the gaps during recording of one of the other episodes. Much as I love Tony Head, Paul put his heart and soul into the performance, even knowing that it’ll never be heard, and it seems rather a shame for him! Mind you, it was also a shame that I didn’t get to see Tony live! Those of you going to later recordings might have that treat to look forward to. Afterwards a lot of people hung around in the bar waiting to see if any of the cast would come out to chat, but again there was too much noise and so I left. It was a great experience and I’m totally grateful to Jules for offering out her spare tickets when her husband and friend couldn’t go. I don’t quite know what to do with my back and feet right now, and after a weekend of running around with brand new LiveJournal friends, seeing Frankenstein twice with them, and then getting only five hours’ sleep before charging back up to London and standing in a queue for two and a half hours, I am half afraid I might fall asleep in the cinema tonight and disgrace myself. Then again, is there any danger of falling asleep watching Frankenstein, even if it is for the umpteenth time! And as an extra extra bonus, I got back to my emails afterwards to find that I’ve got two tickets for the 29th April double recording!! (Channelling Arthur) Brilliant! Jules got her email while she was in the queue, so I’ll see you at the Shaw on the 29th, Jules, and thanks again! Also hi to Claire who had Jules’ other ticket. Not quite sure where we lost you, Claire, but I hope you got home safely! Addendum: There was a really surreal moment when Benedict – all six foot fourteen of him – was recording a scene with an incidental character who was supposed to be taller and more charismatic and good looking than Ben’s character Martin, who is supposed to be short and freckly and not attractive. The actor playing the other guy was older, significantly shorter and a whole lot less good looking, and you could feel the whole audience struggling to laugh in the right places and not to snort in indignation as Martin spoke about how tall and gorgeous the other bloke was in comparison to himself! Totally agree about Paul even though I too am a Tony Head fan. And I wished I could have seen John's reactions more - was a tad at the wrong angle to see behind the mic! - sooo very adorable. See you soon - enjoy the encore this evening! Oh my! The part of me who really, really dislikes any public displays of fangirlishness wants to curl up and die, because what you experienced pre-recording truly sounds like hell on fire. A non-spoilery review is just what I was hoping for, and I'm so glad you delivered! Thank you kindly for sharing your experience. Hopefully now you can give your feet and back the pampering they need. OH, and Tony Head joining Cabin Pressure is the best news EVER. I wondered if they did it pretty much straight through or not. I wish I could come and see a recording! I am so excited for this new series of Cabin Pressure and I've been anxious to here how the recording went today. Thank you for the write up and I'm glad to hear that you had a good time. :) It sounds like a real treat to experience in person. It was lovely today. 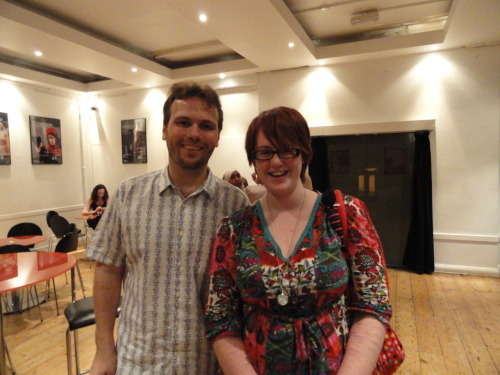 I got a picture with John Finnemore after, and he was the only one who came out. I really enjoyed it and it was amazing to watch it being filmed, the process and everything. & Benedict & John are ridiculously cute. Sorry it took me so long to to reply, I have been quite ill.
You both look fabulous! All accounts point to him being a very very sweet man. I think I'd give just about anything to meet him at this point. He seems like a gem. Random question, but I've always wondered - how long does the recording process take? I know the show is 30 minutes, but I'm certain it takes longer than that to actually record it. Do they just do it once straight through, or does the audience sit through a couple of runnings? It took about an hourish? Maybe a bit more? They do it straight through once, and then at the end they do the scenes that need retakes. The producer came out at the end and said what page/lines they needed to rerecord from, and that was that really. It was very interesting to watch. Oh, thank you so much for such a detailed report! It's a shame I'll probably never get a chance neither to hear any recording, nor to go to the theatre (because I live outside UK), so it's always such a treat to hear from people who actually see and hear this. Do you mind me having posted a translation of your impressions report in sherlock_series community? If you do, I'll delete it immediately. And I hope your back and feet will be OK.
Wow! I've never been translated into Russian before! That's fantastic, and I'm happy for it to stay on the community. Thanks! Thank you so much for sharing your experience at the recording yesterday! It's wonderful to read about for those of us who can't make it, and really, kudos to you for keeping it spoiler free. :D Mr. Finnemore sounds adorable; he deserves to have his genius recognized. Here's wishing your back and feet get their needed rest soon! You were next to me in the queue. Hi! does appear to be Arthur in real life! – would grin with relieved delight whenever a line got a huge laugh. Benedict was hilarious. I hope he gets his voice back soon! This sounds like such a fun recording - thanks for the notes!